Seelenvoll German Shepherds – Breeders of striking West German red and black showline dogs in New England. Our German Shepherds are bred to the highest standards with top-level competition pedigrees including many current world champions. We offer German Shepherd puppies for sale, as well as young trained German Shepherd dogs. Our focus is to create the perfect family companion that is sound of mind, body, and rich in not only pigment but personality and temperament as well. All puppies come with a 4 year health guarantee. Our dogs are all genetically tested and hip certified through PennHip. Puppies are raised and exposed to living in our home with other breeds, cats, and children from birth. 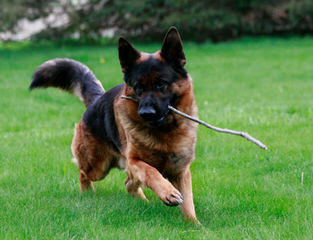 They are AKC registered purebred German Shepherds of the finest quality. Email us today our visit our website to see our dogs. “Soulful”. Seelenvoll.